The Grand Tour AKA the new Top Gear will be airing on Amazon Prime Video on 18th November 2016. We've found a sneaky way to watch the entire first season online absolutely FREE. What's more - it's actually legal. Just want to know how? Wait until all the episodes have aired and then sign up for the free trial to watch them on catchup. Jeremy Clarkson & co will be available to watch exclusively on Amazon Prime Instant Video which usually costs £5.99/month or £79/year. 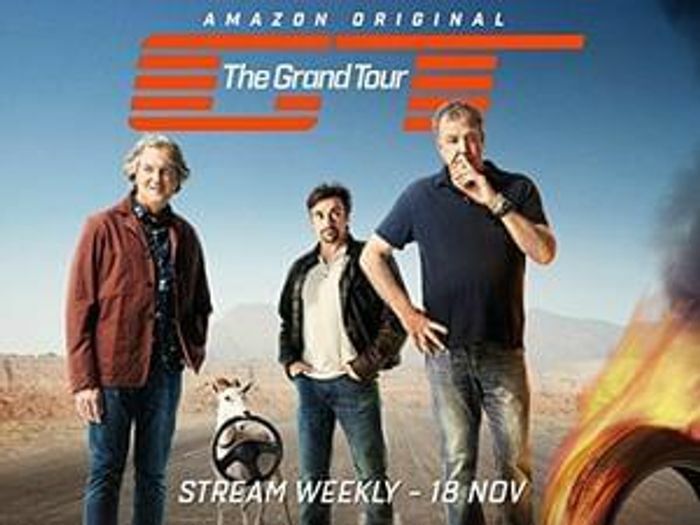 Thankfully, Amazon offers a free month trial of Amazon Prime but, with with the first season 12 episodes long and each episode of The Grand Tour airing once a week, a 30 day free trial will only get you, best case, 4 episodes for free. That's where the sneaky part comes in. Amazon have promised that all episodes of The Grand Tour will be available on their catchup service. So, provided you're patient, you can wait for the entire season of the GT to air and then binge on all the Richard Hammond, James May and Jeremy Clarkson adventures you want! Finally! Have been waiting for The Grand Tour for AGES. Can't wait to watch it. Trailer looks super high budget like a film. TV just hasn't been the same without Clarkson. Very excited to watch this free online! The Grand Tour is going to be brilliant and with this free trial of Amazon Prime should be able to get many of the episodes! Just spotted this Freebie, excellent work Mr Kelsey! I've been rubbing my moustache in excitement to watch the grand tour online for free. I never even knew Amazon Prime comes with the video, music and other things. Quite marvellous. We ought to have a cool wall for freebies. This would be Sub Zero. Great freebie. Not long now until the new Top Gear airs. I wonder if it'll live up to the hype? With Jeremy, Richard and James onboard as well as, I think, their old producer surely The Grand Tour has to be at least as good as Top Gear was on the BBC? I signed up for the trial a awhile back so will only get the first episode free but may subscribe to Amazon Prime Video if it is as good as I hope! Nice one Kelsey. Didn't think of this - had been looking to watch the new top gear online for free on all the other usual places. Good that Amazon do a free trial so that people can get it. Guess we'll have to wait and see if The Grand Tour is too good for people to wait so that they can watch the entire series for free online, or if they'll be happy getting the first few episodes for free and then subscribing - definitely worth it imho. Freddie you gonna watch this mate? Deffo. Literally been waiting for donkeys. Chris Evans can piss off. Nice find, sure loads of people will be wanting to find out how to watch The Grand Tour free online. Love this programme so much, it's so great to have Jeremy Clarkson, Hammond and May back again. This trio were so amazing on BBC Top Gear and I hope this show is even better. Apparently they have spent £3 million on the opening 3 minutes of the show. Being able to watch The Grand Tour free on Amazon Prime Video is perfect for me, it will be so easy to watch it. I already do lots of my shopping on Amazon as the 1 day delivery is so fast!